As a former teacher, I had plenty of vacation time. Unfortunately, nearly all of that time fell under the most expensive times to fly! 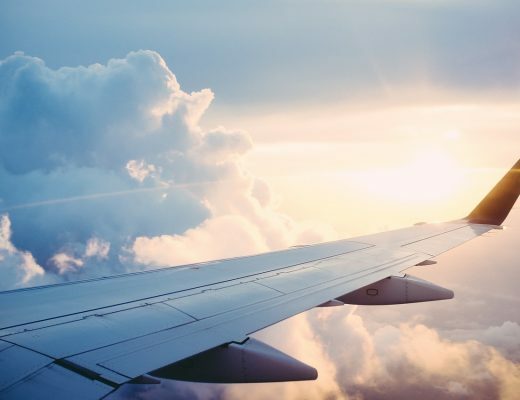 It can be hard to find cheap spring break tickets, as summer, spring break, and Christmas are some of the priciest times to fly. But if you’re a student or teacher – or the parent of school-age children – you may not have a choice in the matter. Enter the amazing Skyscanner. 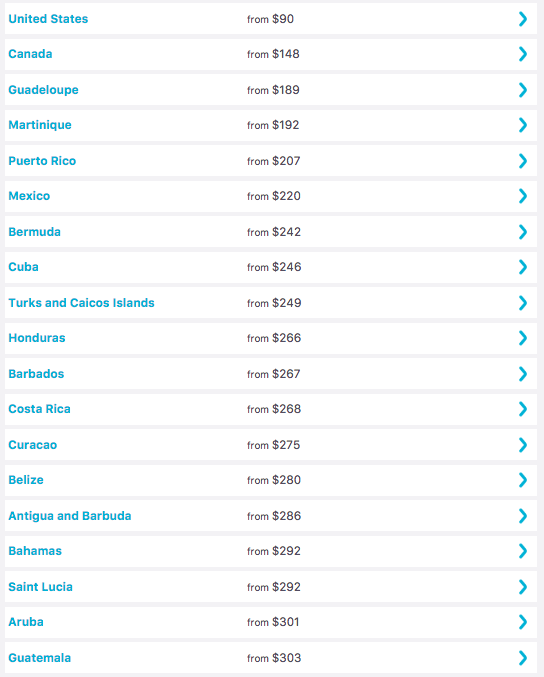 Their “Everywhere” tool will allow you to find the cheapest options, including cheap spring break destinations. If you have an open mind, or a miles-long bucket list the way I do, this is an awesome way to travel! Here, I’ll walk you through the steps to show you how I found a variety of warm yet cheap spring break getaways, all for under or around $300 USD! Set your departing city, set the to field to everywhere, your departing month (or if you have less flexibility, departing days) and then see which options you have. You may want to click “Add nearby airports.” I searched for NYC, which gives the three airports of the NYC area (Newark, LaGuardia, and JFK). 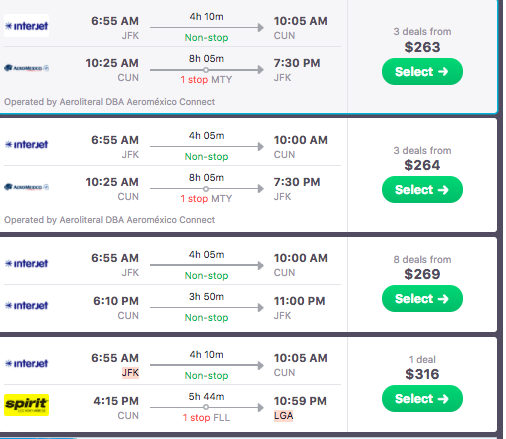 Sometimes there are really great deals out of smaller airports (for example, the Westchester airport for some flights out of NYC, or the San Jose airport for some flights out of San Francisco). It’s worth a shot it scores you cheap spring break tickets. Here’s a list of all the plane tickets that popped up under or around $300 USD roundtrip! 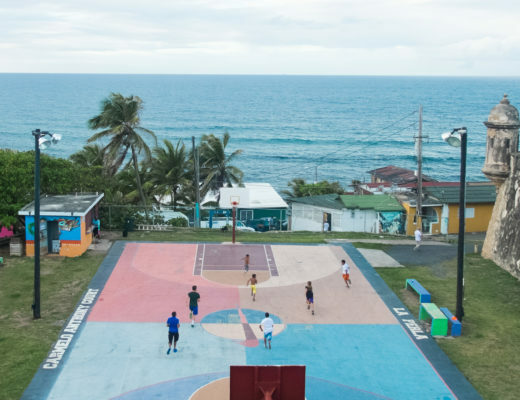 Quite a ton of options, including some surprises – who would have thought of Guadeloupe or Martinique as cheap spring break destinations? That’s why the everywhere feature is so good – because it opens your eyes to new destinations that you may not have considered that are friendly to your budget! 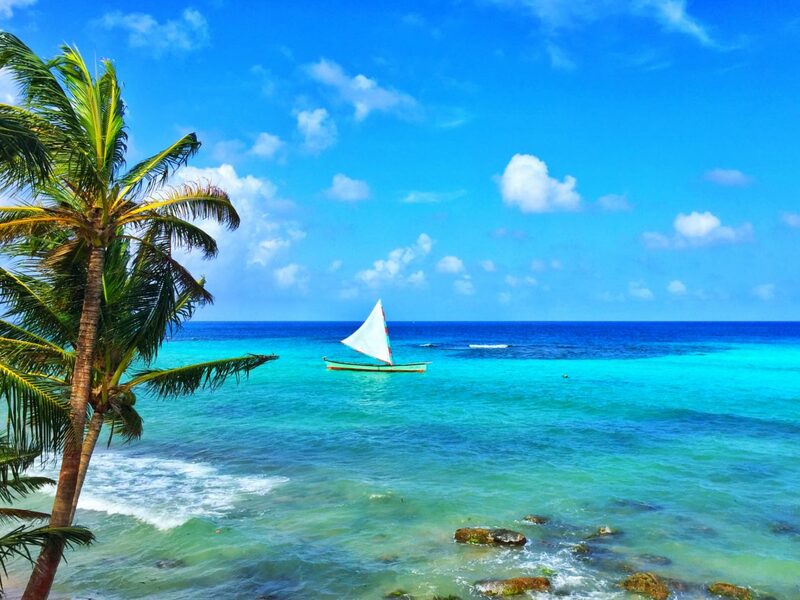 Here, I’ll pick the favorite but usually not cheap spring break destination, Cancún. 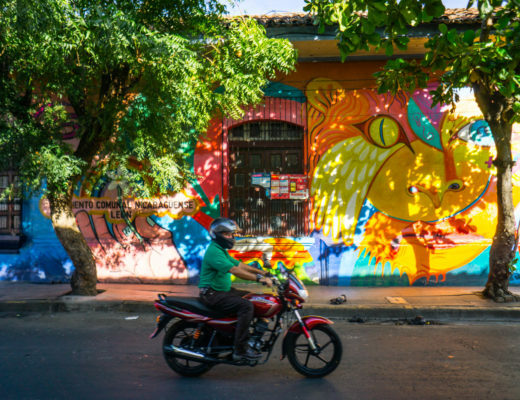 Even though this destination is insanely popular, there are tons of great deals to be found! 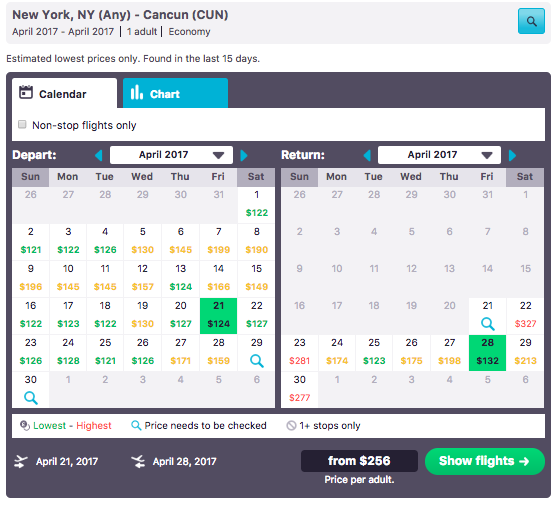 Who would have thought you could get a cheap spring break roundtrip flight to Cancún for under $250 USD? Now, here’s the one bad thing about Skyscanner. The calendar doesn’t show flight prices in real time. It shows the estimated lowest prices based on data found in the last 15 days. What does this actually mean for you? The more searched your flight is, the more accurate the data will be. So, because plenty of people are searching for NYC to Cancun flights, you’ll find more up-to-date data than, say, San Francisco to Tajikistan. For some reason. Let’s see what happens when I click. 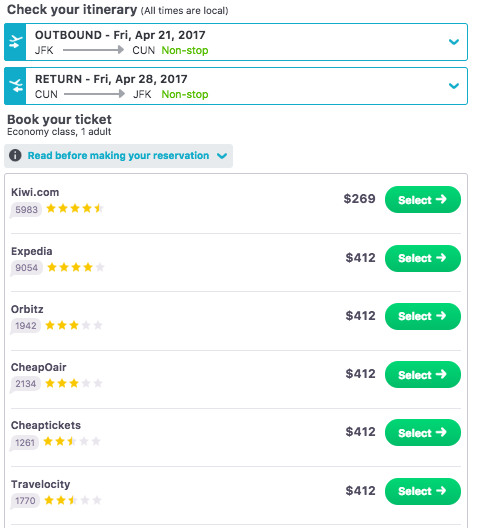 The cheapest spring break ticket option now jumps to $263, because only now do they pull the ticket prices in real time. Luckily, a $7 difference isn’t much of a dealbreaker for most people. You then are given a list of a couple different online travel agencies (OTAs) which have those tickets. 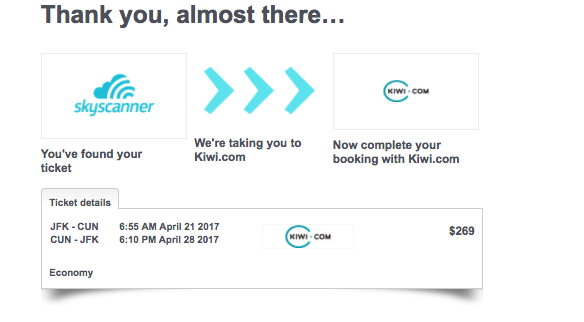 You’ll notice that Kiwi.com, which I’ve literally never heard of until I wrote this post, has the best price by a long shot. So let’s go with them! 5. 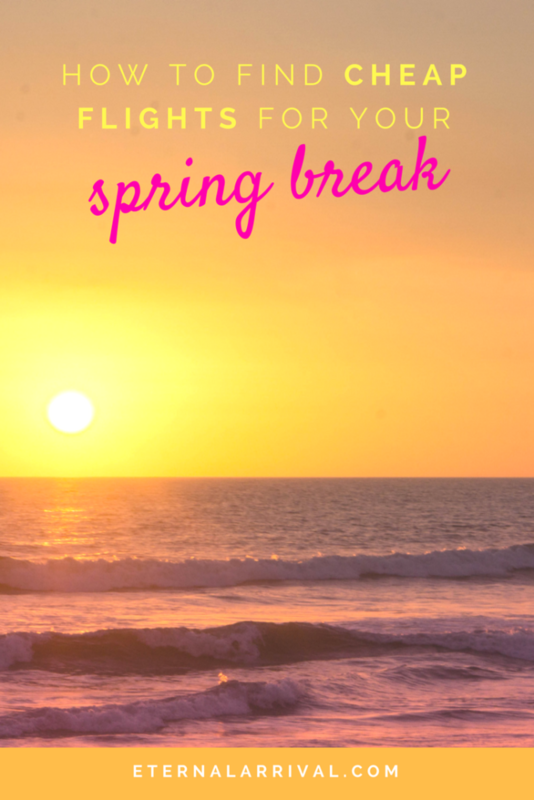 Click through and book your cheap spring break ticket! 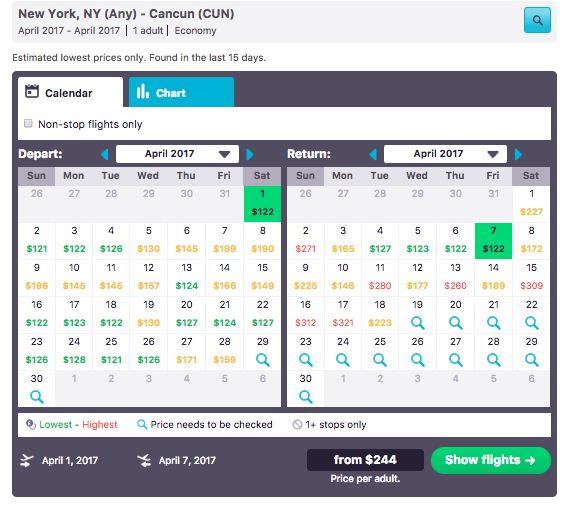 Skyscanner will redirect you to book through their partner website, and your price should stay stable. 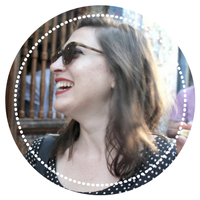 If it’s an OTA you’re not familiar with, you may want to do a bit of research on them first. Trust Pilot is a good resource for making sure your booking company is reputable. I will caution you against booking anything with eDreams! They’re notorious for having some of the worst customer service in the industry. So while it’s not a “scam” per se, it can be a gamble to book with them, as if anything goes wrong with your ticket you may have trouble getting refunded. I have used Expedia, Kayak, Orbitz, and CheapOair all without issues so I can personally recommend those OTAs. Still, book quickly, especially if there is one OTA that is dramatically cheaper than all the rest. They likely only have one or two tickets for that price, as they’ve usually bought them directly from the airline at a discounted price. So when you see a good price, do one quick search, then book, book, book! Note: I have no official relationship with Skyscanner and am writing this because I am a huge fan of their website and use it nearly every time I make a booking. That said, this post does contain affiliate links. That means that if you purchase a flight using one of these links, I will receive a small commission at no added cost to you. It’s a great way to ensure I can keep producing useful information!